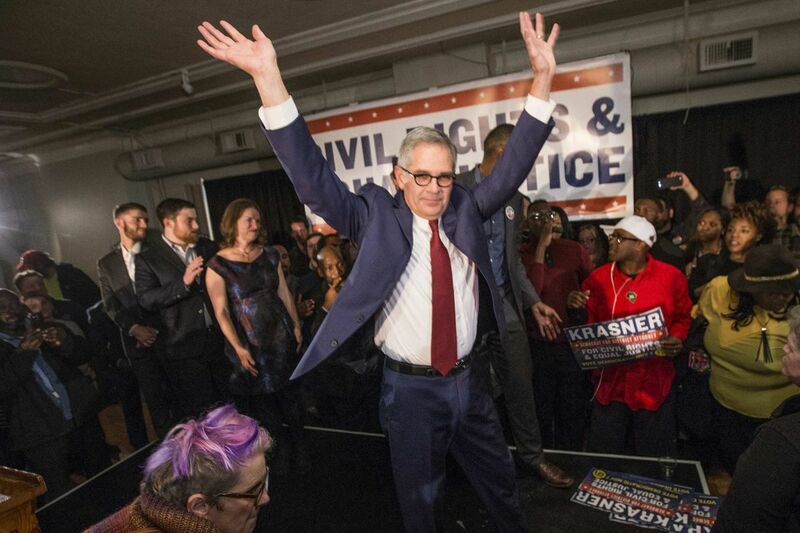 Democratic nominee Larry Krasner raises his arms as he leaves the stage after winning the election to be the next Philadelphia District Attorney on Nov. 7, 2017. If you went to the polls Tuesday, you were voting in a new Philadelphia. A city that, even in the last week, was dramatically remaking itself. And in some areas, it felt as if the changes were happening at light speed. We tend to just accept things – a statue of a deeply polarizing man as the representative of our entire city government. A school system that was obviously failing for years. That's changing. We're shedding the inertia that kept Frank Rizzo's statue outside the Municipal Services Building – surely there's a more appropriate space to grapple with his legacy, like a museum focusing on the city's fraught and often shameful legacy of race, as my colleague Will Bunch has suggested. And the School Reform Commission, which for years hobbled our ability to control our own schools and to shape our children's destinies, could be no more, after Mayor Kenney's announcement that he will seek local control. But not bad for one week in a city whose subways one year ago were still taking tokens. Then there's Philadelphia's embrace of the kind of progressive politics that have established us on the national playing field. Its lawsuit against Jeff Sessions' Justice Department over its punitive attempts to pull police funding over our sanctuary city policies seems likely – and rightfully so – to succeed. (Adios, Jeff.) And city officials are en route to Vancouver this week to tour a safe-injection site – a direct refutation of decades of destructive War on Drugs policies. I hope they bring the idea home. A changing city, indeed. But one with deep, entrenched problems that a week of corrective disruption can't fix. One where a person is murdered nearly every day and whole neighborhoods are still held captive by drugs and crime. Into all this steps Larry Krasner. Results for the district attorney’s race show a city divided by geography and race. 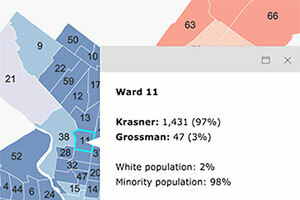 Click here for an interactive map of results by ward and demographics by race. Our new district attorney rode the wave of change in our city. The ambitious, unapologetic progressive dragged the entire race to the left this spring when he entered the primary. Suddenly, candidates for district attorney were tripping over one another to eliminate cash bail. Call it the Krasner Effect. Thing is, his positions – losing cash bail, not prosecuting low-level drug crimes, holding bad cops accountable – aren't radical at all, especially not in a post-Ferguson, post-Freddie Gray world – and in a city that's had back-to-back reformist police commissioners. They're just what's needed. In the end, the choice wasn't really a choice at all, especially when the alternative, Republican Beth Grossman, ran the city's shameful civil forfeiture unit and breezily waved that stain away in interviews with my newspaper. She stayed silent as FOP head John McNesby amped up his rhetoric, from bombastic defense of his officers to dangerous racial invective. Donald Trump is president. Jeff Sessions runs the DOJ. Our city needs an antidote. All that and just the undeniable fact that Philadelphia's justice system has for too long weighed too heavily on poor people and people of color. The great tragedy of Seth Williams' tenure was that the change he began to institute stagnated under the specter of his own criminality. The argument for maintaining a steady, incremental course of reform falls to pieces when the last guy who tried to do it wears jailhouse stripes. The criticism that holds up against Krasner is personality. For 30 years he's had a courtroom demeanor and approach that I would charitably call abrasive and what many prosecutors would call something else. To them, he's a zealot who thought everyone but his clients was lying, and now he's in charge of the city's public safety. They fear he won't be able to build common ground, or really care to. "I see no problem," Krasner told me Monday, in his typical blithe tones, while getting his Election Day shoes shined at the Reading Terminal. Don't believe what you read, he said — he's hearing from many excited prosecutors and police. "Getting ready for prom," he told the shoeshine man, hopping into his chair. The big chair is Krasner's now. The onus for progress falls on him – to forge coalitions, to implement his ambitious and necessary agenda, and to support the cops and prosecutors on the front lines. He made his mark tearing down prosecutors and police. Now he's got to build bridges. Now he answers for victims. What's undeniable is that election represents the right shift in the way Philly views its criminal justice system — from an incremental we're-doing-our-best approach of reform, to radical change. The job of the district attorney is to stem the violence. Krasner's argument to do it boiled down to a simple truth: Long-overdue reforms will make a city safer. A more equitable system means fewer people trapped in cycles of poverty and incarceration — and less crime. He's right. Now he's got to form the relationships to make sure he can do it. The stakes couldn't be higher. Because another simple truth also holds true: If the violence rises, all of Philly falls.